Also serving communities of Central, Six Mile. There are 5 Assisted Living Facilities in the Seneca area, with 4 in Seneca and 1 nearby. The average cost of assisted living in Seneca is $3,314 per month. This is lower than the national median of $3,346. To help you with your search, browse the 37 reviews below for assisted living facilities in Seneca. On average, consumers rate assisted living in Seneca 4.6 out of 5 stars. Caring.com has helped 6 families in Seneca find high-quality senior care. To speak with one of our Family Advisors about assisted living options and costs in Seneca, call (855) 863-8283. Located in Oconee County, the city of Seneca, SC, is home to a considerable senior demographic — about 20 percent of the population is aged 65 and over. Currently, Seneca features four assisted living facilities with a further three in proximity to town. The South Carolina Department of Health and Environmental Control licenses and regulates these facilities that offer a customized level of care and assistance to seniors with activities of daily living such as bathing and dressing. These facilities feature a home-like atmosphere and supervision of medications. The cost of living index in Seneca, SC, of 89 is less than the national average of 100. This may be good news for seniors living on fixed incomes as it may leave more funds in their budgets to pay for assisted living care. South Carolina does not tax social security checks. This, too, may leave seniors with more funds in their budgets more monthly expenses. The Seneca area is home to outstanding medical facilities, including the Oconee Memorial Hospital, in the event of medical emergencies or illness. There are multiple cultural attractions in and around Seneca that seniors may enjoy visiting such as the Blue Ridge Arts Center, General Store Museum, the Seneca Library and Oconee Heritage Center. Seneca features an array of resources for seniors, including the Oconee Senior Center, which offers exercise classes, a computer lab, dance classes, library, games, and educational seminars. Some seniors may feel concerned about Seneca’s average annual crime rate of 3,154 per 100,000 people, which is slightly above the national average of 2,837 per 100,000 people. Assisted Living costs in Seneca start around $3,314 per month on average, while the nationwide average cost of assisted living is $4,000 per month, according to the latest figures from Genworth’s Cost of Care Survey. It’s important to note that assisted living rates in Seneca and the surrounding suburbs can vary widely based on factors such as location, the level of care needed, apartment size and the types of amenities offered at each community. 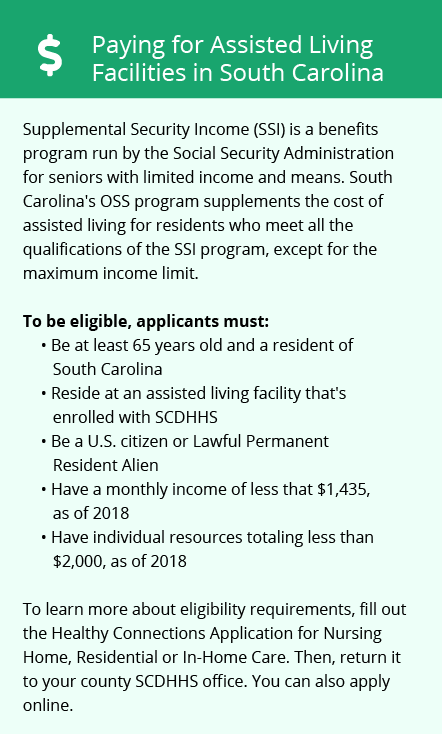 Currently, the state of South Carolina offers one public financial assistance waiver to help seniors pay for care at an assisted living facility. The Home & Community Based waiver is designed to provide financial support for this level of personalized care. 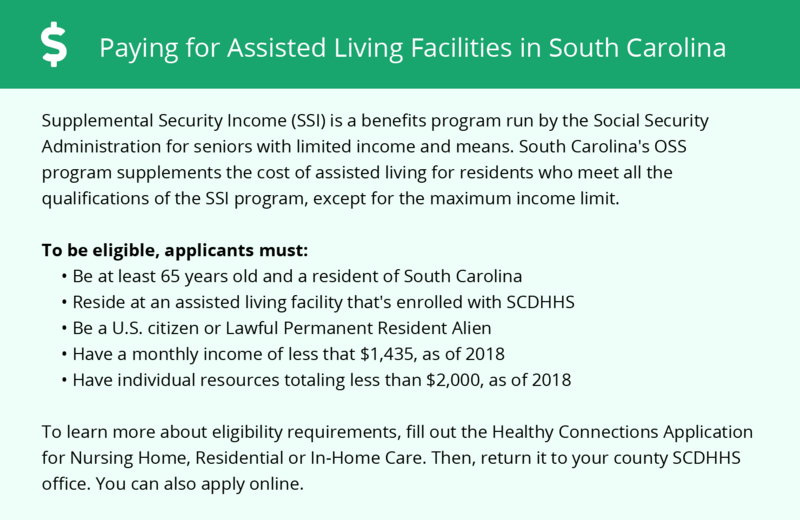 Additionally, seniors who receive SSI benefits may be eligible for the state of South Carolina to pay a monthly supplement for care at an assisted living facility. Seneca and the surrounding area are home to numerous government agencies and non-profit organizations offering help for seniors searching for or currently residing in an assisted living community. These organizations can also provide assistance in a number of other eldercare services such as geriatric care management, elder law advice, estate planning, finding home care and health and wellness programs. To see a list of free assisted living resources in Seneca, please visit our Assisted Living in South Carolina page. Seneca-area assisted living communities must adhere to the comprehensive set of state laws and regulations that all assisted living communities in South Carolina are required to follow. Visit our Assisted Living in South Carolina page for more information about these laws.